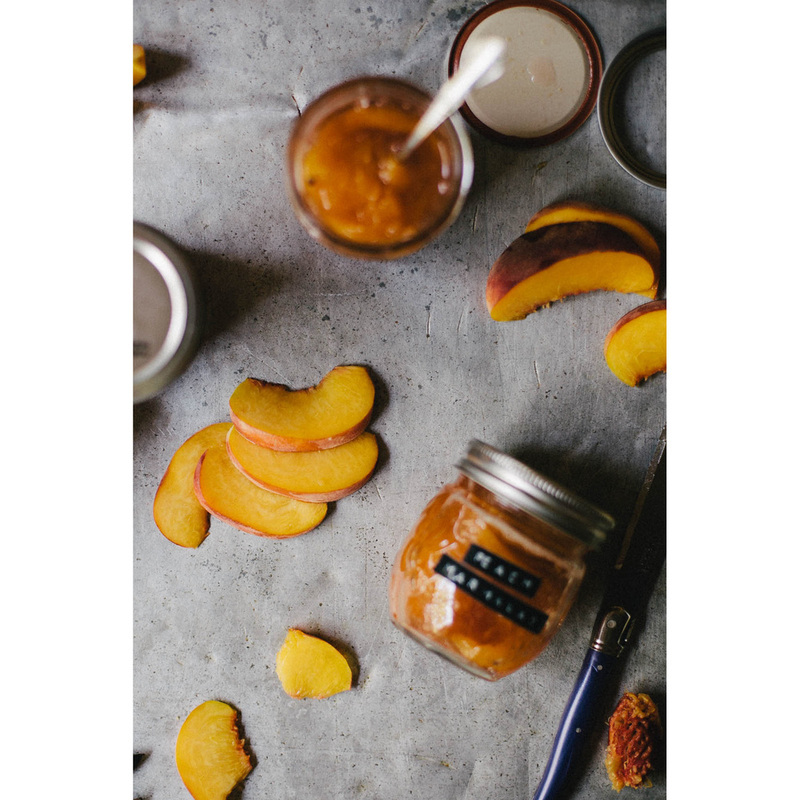 Peaches in Jars — always with butter. 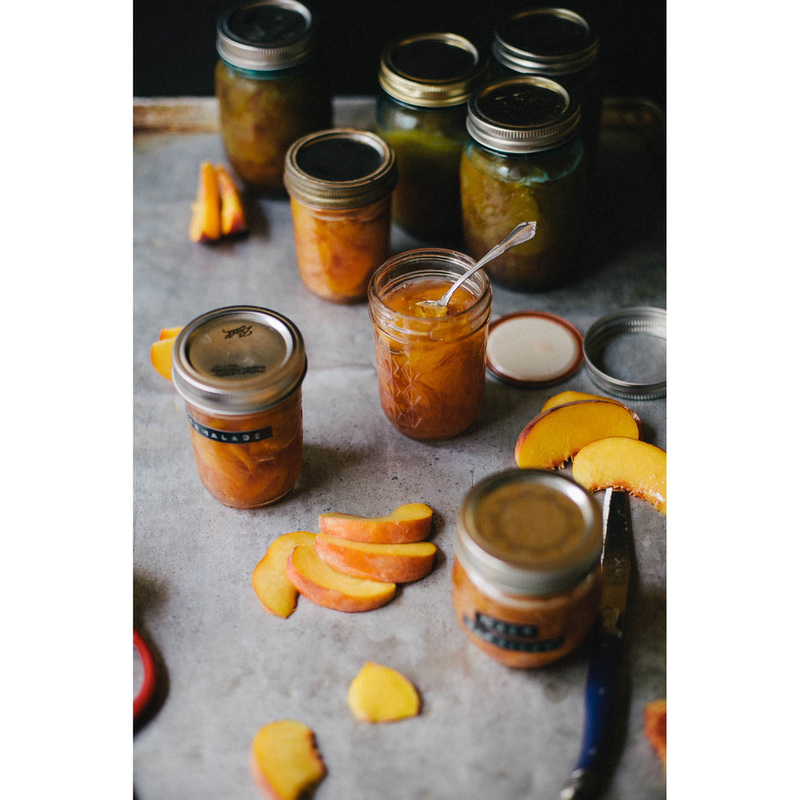 So at the beginning of the month I got an email from the website Sweet Preservation, wanting to know if they could send me over peaches to do a canning recipe post. I think I must have somehow got added to some list where I now get all these emails for people wanting me to blog their recipes or new product or something. They all go immediately in the trash folder. I'm not blogging to promote your company, I'm blogging as a way to keep photography present in my life. But this email was the one special one that caught my eye. They weren't trying to get me to promote some weird drink recipe or something, they were about local, seasonal produce and preserving them to last all year long. I couldn't say no. This post would have been probably made regardless of them sending me the peaches or me buying them at the store. Peaches are everywhere, stone fruit is everywhere. So when I replied yes to the email, the next week I got a massive box of peaches from Washington state farmers. It was amazing. 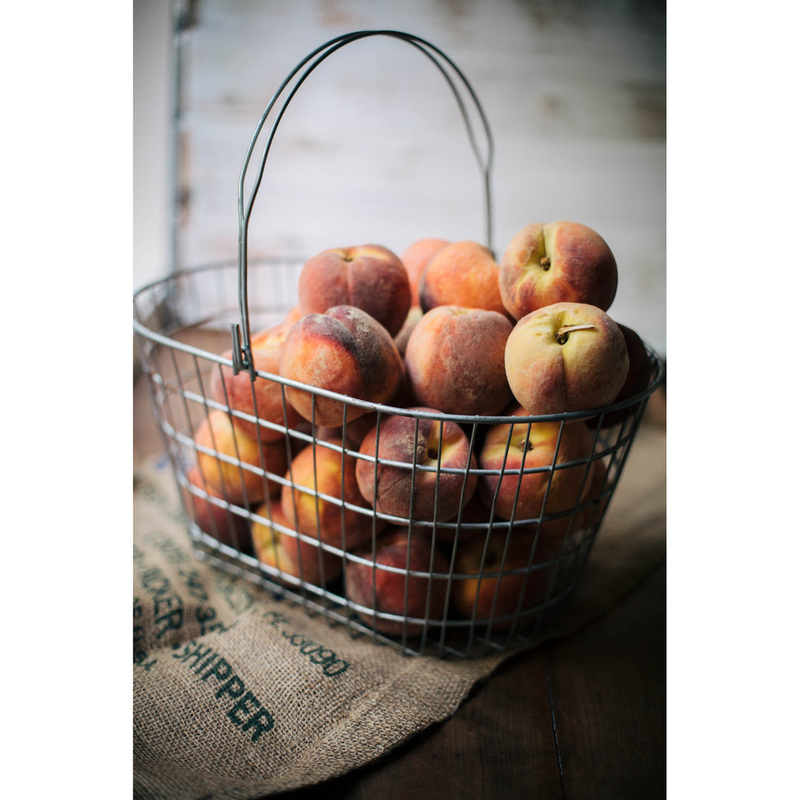 I love Washington, farm fresh peaches rocks and I always want to can things. For the record, my love of Washington is from my one impression from a trip with my Dad years ago. I thought Seattle was great and the northern part of the state that we went to was beautiful. So that one impression of me has lasted and I will forever proclaim my love of Washington. So for this rare occasion, this is a sponsored post, but by a great company so I don't feel bad about it at all! The box of peaches was far above abundant so more than one recipe was needed. A girl can only eat so much jam, eh? So I decided to make peach marmalade and peach syrup, for iced tea. The first recipe seemed like one that would just be able to show off how awesome the peaches taste. The latter is kind of from a silly inspiration. My weird love of snapple peach tea. I chug that stuff. I love it more than any other drink I can think of. Their processes and ingredients are pretty similar, the syrup is just the reduced strained liquid from boiling down the peaches and sugar. They both worked out pretty well. For the marmalade I should have probably cooked it down more. It is kinda loose. The fear kicked in of over cooking it like I have done to most of my jams/marmalades in the past. They get really really thick and somewhat impossible to spread on a piece of toast without being left with crumbled shards of bread at the end. But the taste of this marmalade is great so I will probably end up just pouring it over some vanilla ice cream and call it a day. The new job is working out well, no complaints at all. I really like talking to all my co-workers and customers. My old job left me feeling so socially awkward because I would generally go hours without having anyone to speak to. I found I like getting to talk to people all day. I thought I might go all weird and silent because I was so used to not having to talk but it wasn't the case, thank god. It is ridiculously hot in my apartment right now, baking off christmas cookies. Yes christmas cookies in August. Because I was asked to do photos for a certain magazines winter issue. I'll tell you more about it when the issue comes out, I'm too superstitious that something will happen and the photos won't get used. Because this is a good one, when I got the email, I was like 'seriously me?'. It's a magazine that I love and feel super honored to shoot for. Merry Christmas in August folks! 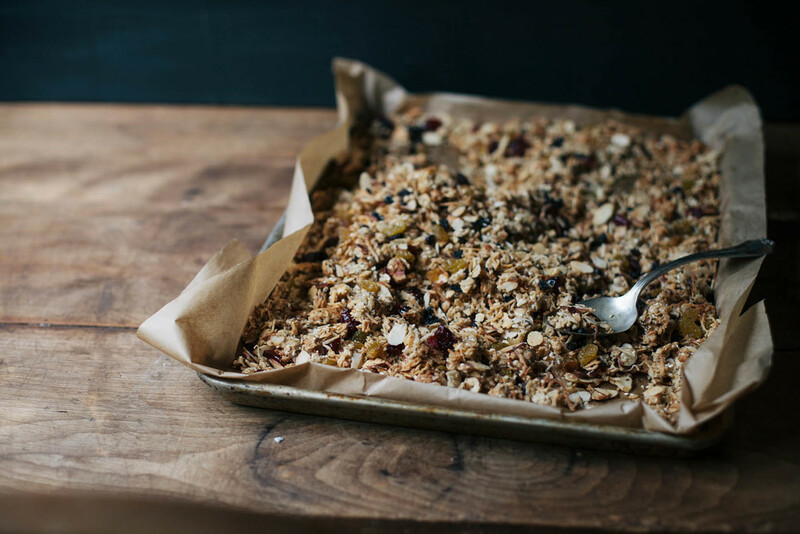 I made granola too that day so I threw it in for the photos as well. I used the same recipe that I post before, poppy seed pistachio and pecan granola, but changed things up a bit. I.E. threw in whatever I had in my cupboard in replaced of the actual things it called for. Pistachios and pecans became almonds, maple syrup became honey, coconut was to use up the rest of it and some dried fruits added after it cooled down. Combine all ingredients in a large pot and let sit on counter for 30 minutes. Transfer to stovetop and bring to a boil over med/high heat. Cook until liquid has reduced and become syrupy. Stir often, should take around 30 minutes. Skimming any foam off of the top. Ladle into hot, sterilized canning jars, top with lids and can in a water bath for 10 minutes. Let sit on counter until completely cool. Store in a dark cupboard, and refrigerate once opened. Makes 4 half pint jars of marmalade. See the Ball Jar website for proper canning instructions. Bring all to a boil in a large saucepan, over high heat. Reduce heat and simmer gently. Occasionally mash the fruit until peaches are very tender and liquid begins to reduce. Should make 1 pint jar. When using in tea, dilute to your taste with black tea. I did probably a 1:6 mixture with 1 part syrup and 6 parts tea.